Duration: This tour is approximately 1 ½ hours in length which includes about 30 minutes of flight time and 55-60 minutes at the dog camp. 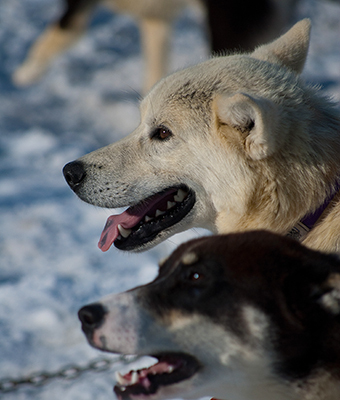 Your time at the dog camp will include instructions on dog sledding, stories about the famous Iditarod race as well as 20-25 minutes of dog sledding. Please allow an additional 45 minutes for transportation to and from the hotel, a safety briefing, and outfitting of glacier boots. Description: Join us as we fly over the lush rainforest, deep blue crevasses and glacier carved peaks as your pilots give you a spectacular flight seeing tour to our Dogsled camp on the Mendenhall Glacier. Here the professional mushers and Alaskan sled dogs will have you driving the team or relaxing in the sled as you take in the awe inspiring scenery. You will have time to talk with the musher’s or take pictures with the dogs before your helicopter takes you back to our base and civilization. Don’t miss out on this truly Alaskan Experience.